On Saturday, after work I came home by way of the supermarket. I was trawling the isles looking for inspiration for dinner. There seemed to be a big promotion on red meat and on salads such as guacamole. Bingo, inspiration had hit! On Friday my better half D flew to Poland for ten days of hiking, drinking and seeing old friends and left poor little me behind to look after the animals. In fairness to him, he did ask me to go with him but I politely declined. When he is away, I always whip up a batch of Guacamole. That was Fridays dinner. I decided to pair the left over Guacamole with the promoted steak, picked up a few other items and off home I went. 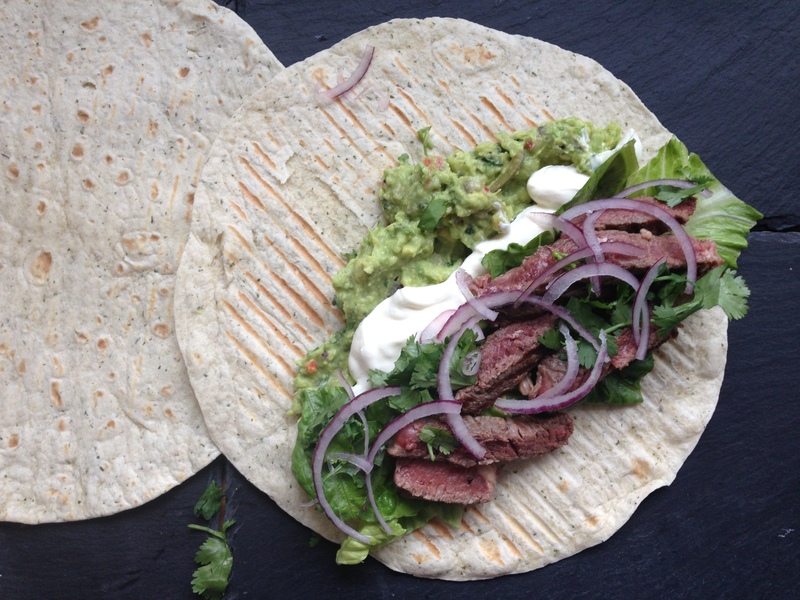 Steak tacos for dinner it was! I very rarely use the word ‘taco’. Probably because until recently I didn’t realise the difference between a taco and a tortilla (tortilla being the shell and the taco is the dish made using the tortilla). I’m embarrassed to say, but I had to google this to find out. But now I know, cool! So I put on the steak, grilled the tortillas, sliced some onions and washed some salad leaves. I assembled the tacos, went to wash my hands, turned around and … the dog had eaten my dinner! The cheeky little thing had jumped up and grabbed it from my plate and run into the garden to enjoy in peace. I contemplated making another one, then realised that the dog had also eaten my spare tortillas. When did she grab those? I simply have no idea what to do with this dog. I yelled bad dog and she ran off, tail between her legs, ears pulled back and crouching as low as possible. I didn’t talk to her for hours and left her out in the utility area. It’s not like we don’t feed her. What can I say.. I made this again last night, having trundled off to the shop to buy the ingredients (again!!). It was delicious. I woke up this morning, about to write about last nights yummy dinner and saw that a lot of my food blogger friends were writing about Cinco de Mayo. Another bit of internet searching later (thanks Wikipedia) and I discovered that today is known as Cinco de Mayo. Also known as the Anniversary of the Battle of Puebla, a national holiday in Mexico in honour of a military victory in 1862 over the French forces of Napoleon III. With this being celebrated in Mexico and the US, I marveled at the fact that I seem to be making food that celebrates this day without even knowing it. 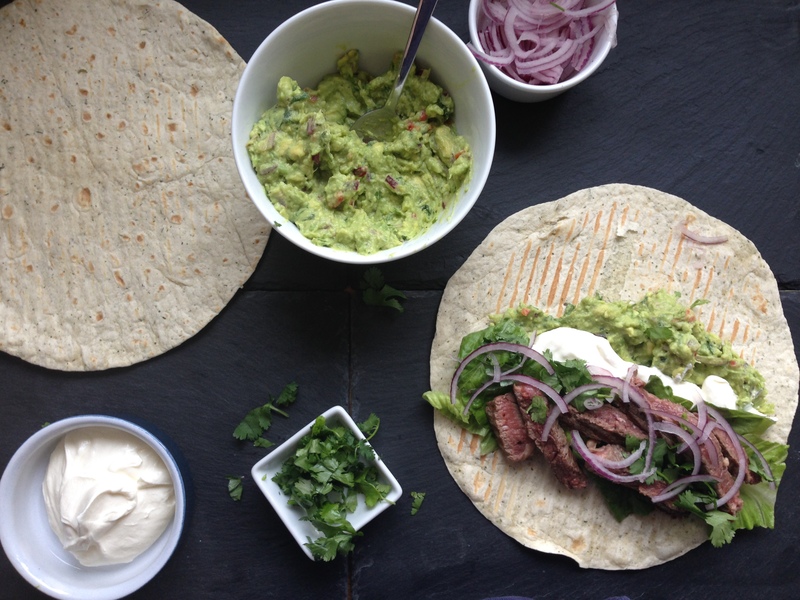 The great thing with this dish is that, apart from the steak and the tortillas, you can add anything you like. Radishes are fab in this dish too and any number of salad ingredients. Heat a griddle pan over a high heat. Spray a little oil on the pan. 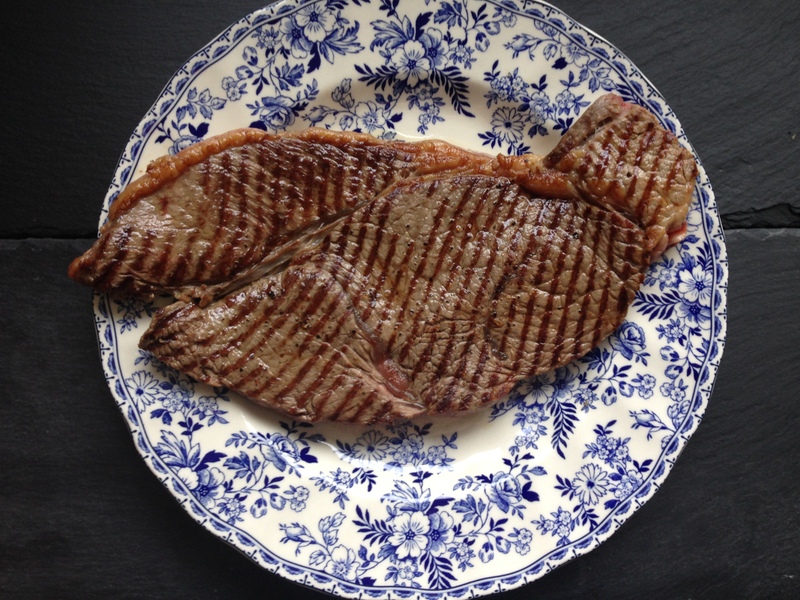 Season both sides of the steak and pop onto the griddle pan. Cook for about 5 minutes per side for medium-rare. Remove from the heat and rest for 5 minutes. Meanwhile, slice the onion very finely, chop some coriander and get the guacamole and sour cream out of the fridge. I like to heat my tortilla on a pan first, but it is not totally vital. 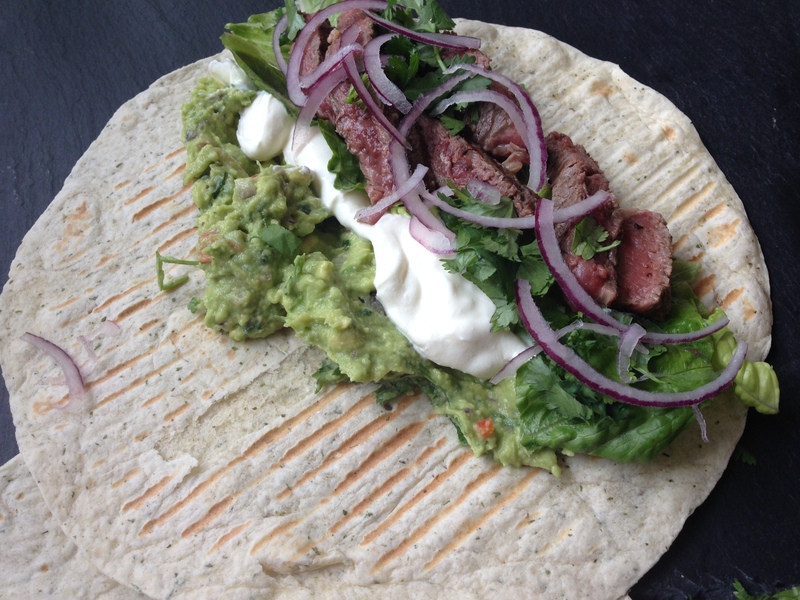 Slice the steak, lay the slices onto some guacamole, top with sour cream, red onion and coriander and enjoy! These look great. Now that it’s grilling season, this looks like a perfect recipe for the weekend. This looks delicious! Oh my gosh…my dog would do the same thing. You just can’t turn your back on these bad dogs! 🙂 You’d think I was starving my dog too…and yes, your post is very good timing. Happy Cinco de Mayo! Ha ha, yes heartbroken. Just glad I made them again and just in time for Cinco de Mayo! They were sooo tasty!